On December 19, 1960, Charles “Charlie” O. Finley purchased a controlling interest in the team from Johnson’s estate after losing out to Johnson six years earlier in Philadelphia. He bought out the minority owners a year later. Finley promised the fans a new day. In a highly publicized move, he purchased a bus, pointed it in the direction of New York, and burned it to symbolize the end of the “special relationship” with the Yankees. He called another press conference to burn the existing lease at Municipal Stadium which included the despised “escape clause.” He spent over $400,000 of his own money in stadium improvements though in 1962 the city reimbursed $300,000 of this. He introduced new uniforms which had “Kansas City” on the road uniforms for the first time ever and an interlocking “KC” on the cap. This was the first time the franchise had acknowledged its home city on its uniforms. He announced, “My intentions are to keep the A’s permanently in Kansas City and build a winning ball club. 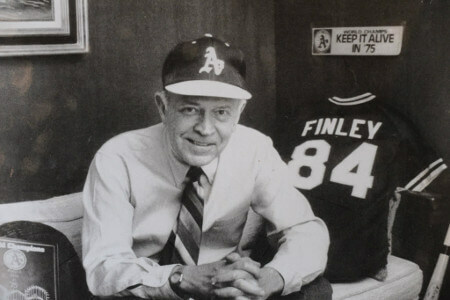 I have no intention of ever moving the franchise.” The fans, in turn, regarded Finley as the savior of Major League Baseball in Kansas City.